Many political pundits and even the President and Vice-President themselves are decrying the amount of money being spent behind the scenes in the 2010 election. I happen to agree, as I have been concerned about this for about a decade now. Nearly half a trillion dollars, some $480 million, was spent just on 527 committee activity in the 2004, 2006, 2008, and so far in the 2010 elections. However, look at who and which organizations are spending behind the scenes by examining the contribution to 527 political organizations, otherwise known as "soft money." This money is not subject to the same legal constraints as direct contributions to a state or national candidate. Fortunately, organizations like the Center for Responsive Politics (www.OpenSecrets.org) scour the required campaign disclosure statements and publish the results. Here are the total for the top contributors to 527 committees for the time period covering the 2004, 2006, 2008, and 2010 election cycles. Obviously, not all the 2010 contributions are included as the 2010 election is still in progress. A few things are notable from the table and chart. The Service Employees International Union (SEIU) is the 800-pound gorilla of 527 campaign funding, providing nearly 30% of the total 527 funding. SEIU was a major contributor to the Obama Presidential campaign and various current and former SEIU executive members are now part of the Obama Administration, including frequent White House visitor, former SEIU President Andy Stern on the President's Deficit Commission and SEIU Secretary/Treasurer Anna Berger at the President's Small Business Summit. Many of those funding the Joint Victory Campaign 2004 are also major campaign contributors including George Soros of Soros Fund Management and the Open Society Institute, Peter B. Lewis of the appropriately named Progressive Corp., and Stephen Bing of Shangri-la Entertainment. Those contributing to the Victory Campaign 2004 (not to be confused with the Joint Victory Campaign) were primarily smaller donors. Nine of the top ten donors gives primarily to Democratic Party candidates. The one Republican-oriented group is Perry Homes. Robert J. Perry is perhaps most infamously known for the Swiftboat campaign against John Kerry in the 2004 Presidential race. Golden West Financial is the brainchild of Herbert Sandler and Marion Sandler. Well Fargo Bank, who purchased Wachovia Corp. during the height of the 2008 financial crisism was forced to modify loans sold by Golden West Financial's World Savings, which was later purchased by Wachovia. Both of the Sandler's are major contributors to the Center for American Progress, a leftist, progressive think tank, also often connected with George Soros. It is also interesting to see the contributions by election cycle. 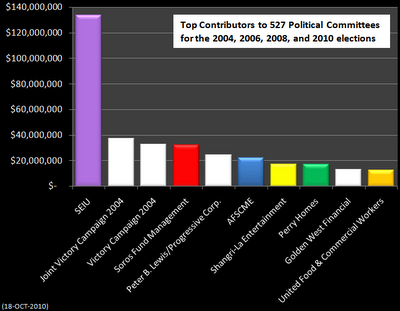 It becomes obvious that SEIU is the dominant 527 committee donor. It also becomes obvious of the huge sums spent in the 2004 and 2008 elections, which were Presidential election years. NPR: "Who's Who: Key Leaders Of Independent Groups"